Formaje Sketch Page showed the interpretation of the forming action by several artists and a was call for any isslustrator who likes to experiment. Theme: illustrate any meaning of the word “formaj/e” (forming) – the action of giving forming, giving a form to an object. The only limitations are the format of the Formaje Sketch Page (22.5 x 22.5 cm) and the deadline was 21.04.2013. After a month the best works generated are now displayed at Home Matasari. + Valeria Anghelache, Flavius Augustin, Cătălin Banu, K. Benton, Alina Bohoru, Dinu Brătean, Ralu Ciubotaru, Andrei Cojocaru, The Damned, Dubios21, The Fly, Anna Grozavu, Hippie Cheese, ITI, Ana Kun, Filip Letinu, Ioana Lupaşcu, Ingrid Maschek, Monk Ink, Sergiu Neghina, Ortaku, Radu Otărăşanu, Silviu Pădurariu, Cristina Pecherle, pentaxsupersonic, Prigo, Priorităţi, Mircea Pop, Liviana Popa şi Gergo Szendrei. Party with FANAS (jazz-funk & electro). 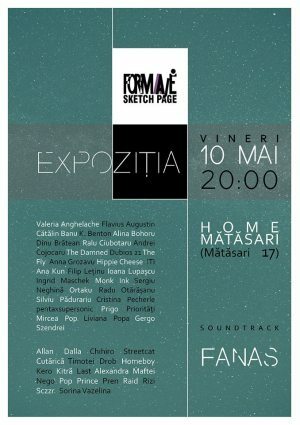 "Formaje Sketch Page - THE SHOW" Art Show in Bucharest. You can get here description, reviews, address, time and details of "Formaje Sketch Page - THE SHOW" Art Show in Bucharest. Visit Bucharest Tips for more Art Show events in Bucharest!